Page 7 (picture) We Don't want SWINGERS IN OUR Neighborhood Stop the Disco Now ACORN. Members of the East Midtown Community Organization In Memphis think that disco belongs on the radio, not in their neighborhood. They protested when the city allowed a lounge/disco to open at a spot where a family restaurant had formerly been located. (main text) for a public hearing in the affected neighborhood within 30 days of the release of the study and before a hearing at the City Council. Young also said that because of all the attention ACORN members have focused on the issue he doesn't think the city will close the fire station. NSRAG intends to keep the pressure until the issue is resolved. Louisiana Twenty ACORN members in New Orleans proved again that action gets results when they hauled trash to the median strip of a busy intersection to protest the lack of regular heavy trash removal in the city. Actually, even the threat of action was enough to bring results. Neighbors reported the highly unusual sight of ten sanitation trucks picking up trash just a few hours before the demonstration. " You people sure get things done around here," remarked a nearby gas station owner. ACORN had invited the acting director of the Sanitation Department to meet them at the corner but he didn't show up. Instead he sent out the trucks and according to a newspaper report the next morning, promised citywide pickups of heavy trash beginning in November. The promise became reality in early November as trucks rolled in the Uptown area and a schedule of pickups was announced for the rest of the city. The city plan falls short of ACORN's expectations because it doesn't give neighborhood residents a specific day every month to put the trash out but it is a major step in the right direction and a big win for Louisiana ACORN. Michigan With an average annual snowfall of 67.5 inches, Grand Rapids gets more snow than any other ACORN city, So it's not surprising that even before the snow began falling, Grand Rapids ACORN members were concerned about "shoveling out" this winter. In early November, the City Commission proposed an ordinance which would levy fines of $25, $50 and $100 against residents who failed to shovel their side walks within 24 hours after a snowstorm. While ACORN members agreed that un-shoveled sidewalks create dangerous conditions in the neighborhoods, they felt that the ordinance was far too hard, and proposed the following changes: - The fines should be lowered considerably. - Special consideration should be given to all economically disadvantaged, physically handicapped or elderly persons to allow them adequte time to clear the side walks without penalty. ACORN member Jim Wilson presented these demands at a public hearing, and one week later ACORN members returned for the City Commission's final consideration of the ordinance. While the Commission did not accept ACORN's entire proposal, it did vote unanimously to lower the fines by more than half and gave a verbal pledge to take people's circumstances into consideration before ticketing them. Grand Rapids ACORN members intend to hold the City to its word. " Just let them try to give me or other old people one of those tickets!" warns Willie Mae Williams. "We'll be right back down here and we'll pile them on the Mayor's desk! " Arkansas 150 ACORN members crowed into the Little Rock ACORN office on November 8 to meet with Robert Embry, Assistant Secretary of the U.S. Department of Housing and Urban Development (HUD). Groups from Little Rock, Bryant, Stuttgart, Dewitt, Pine Bluff, Arkadelphia, and Conway were represented. An ACORN member from faraway Tulsa, Oklahoma, also attended the meeting. Each group opened with a prepared statement describing the problems its members were having with HUD's Community Development Block Grant program. All the complaints accused the CDBG program of sloppy workmanship, poor administration. misuse of funds and lack of sensitivity for the poor. A spokesman from the Little Rock area stated that housing projects supported by CDBG funds are not being maintained and are now unlivable; collapsed ceilings, broken windows, rats and roaches are common sights.The representative from Byrant said that mismanagement of the City's CDBG grant had placed a heavy financial burden on people in the project area. In the closing minutes of the meeting ACORN read its demands to Embry: 1. Immediate on-site inspections by HUD- including public hearings - for all projects represented at the meeting. 2. Follow-up visits by HUD officials every three months to monitor progress on ACORN's complaints. 3. A formal reprimand to the Little Rock Area Office of HUD for inadequate supervision of Citizen Participation requirements around the sate. 4. Referral of complaints outside Embry's jurisdiction to HUD's Housing Division, and action on the complaints within 30 days. Embry immediately agreed to three out of the four demands. He passed the buck only on demand number two which he said would be determined by legislation now before Congress. A final note: At this time. Bryant ACORN is seeing some action by the Little Rock HUD Office on its sewer project. ACORN members feel that nothing would have been done at this time were it not for the meeting with Mr. Embry. Mary Bryant Mules Kick Back Atlanata, GA. " This is a star in our crown, We really beat the city this time!" exclaimed Georgia Action/ACORN member Doris David when the cotes were counted in Atlanta's referendum on a sales tax increase. GA vigorously opposed the increase and all its hard work paid off, as the voters cast their ballots three to two against the tax hike. GA's campaign included passing out over 15,000 leadlets at meetings, shopping centers, churches, workplaces and door-to-door; organizing in GA neighborhoods and senior highrises to get out the vote; and dramatizing the issue with actions. GA presented a rebate "check" to Colonial Stores to demonstrate the windfall they would receive if the property tax rollback accompanying the tax sales increase took effect. They gave a bag of play money to the President of Southern Bell as an award to the biggest winner in the "sales tax scam." 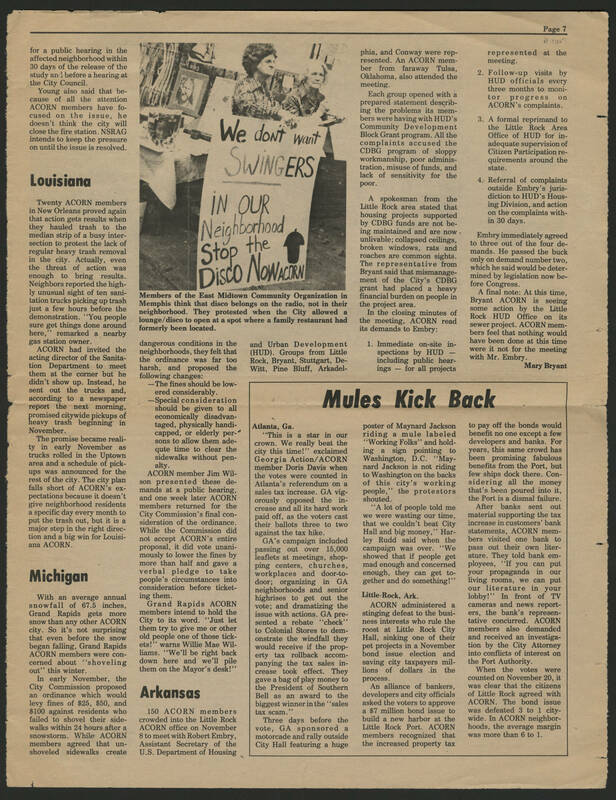 Three days before the vote, GA sponsored a motorcade and rally outside City Hall featuring a huge poster of Maynard Jackson riding a mule labeled " Working Folks" and holding a sign pointing to Washington, D.C. "Maynard Jackson is not riding to Washington on the backs of this city's working people" the protestors shouted. " A lot of people told me we were wasting out time, that we couldn't beat City Hall and big money," Harley Rudd said when the campaign was over. " We showed that if people get mad enough and concerned enough they can get together and do something! " Little Rock, Ark. ACORN administered a stinging defeat to the business interests who rule the roost at Little Rock City Hall, sinking one of their pet projects in a November bond issue election and saving city taxpayers millions of dollars in the process. An alliance of bankers, developers and city officials asked the voters to approve a $7 million bond issue to build a new habor at the Little Rock Port .ACORN members recognized that the increased property tax to pay off the bonds would benefit no one except a few developers and banks. For years, this same crowd has been promising fabulous benefits from the Port, but few ships dock there. Considering all the money that's been pored into it, the Port is a dismal failure. After banks sent out material supporting the tac increase in customers' bank statements, ACORN members visited one bank to pass out literature. They told bank employees, " If you can put your propaganda in our living rooms we can put our literature in your lobby!" In front of TV cameras and news reporters, the bank's representative concurred. ACORN members also demanded and received an investigation by the City Attorney into conflicts of interest on the Port Authority. When the votes were counted on November 20, it was clear that the citizens of Little Rock agreed with ACORN. The bond issue was defeated 3 to 1 citywide In ACORN neighborhoods, the average argin was more than 6 to 1.